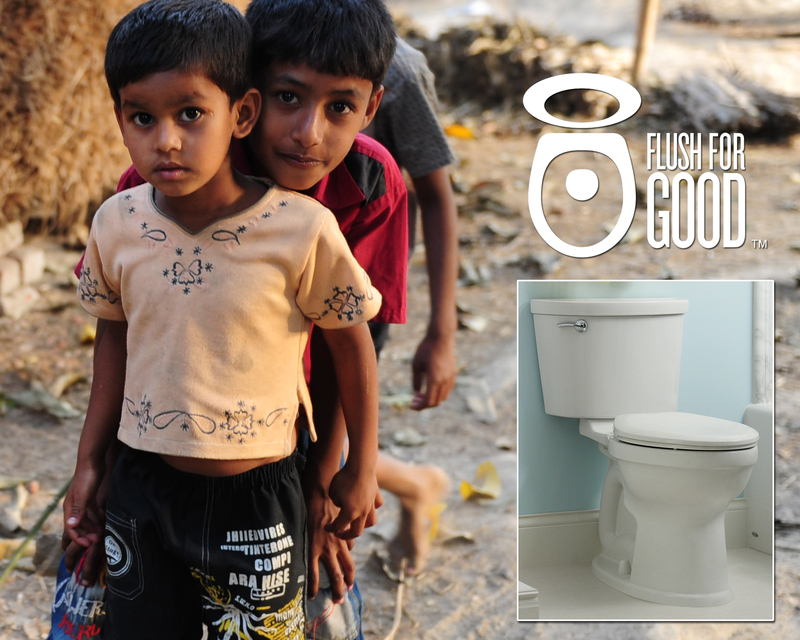 Flush for Good: Celebrating World Toilet Day with Awareness and a Giveaway! You are here: Home / Philanthropy / Flush for Good: Celebrating World Toilet Day with Awareness and a Giveaway! This is a sponsored post written by me on behalf of American Standard. All opinions and text are mine. I received a Lowe’s gift card in exchange for this post. Also in exchange for this post, 20 sanitary toilet pans will be donated to a community in need (10 in my honor and 10 in yours!) via BRAC USA and WaterAid. So just by reading this post, you will be helping communities in need of sanitation. How cool is that? Also, you’ll get the chance to win your own Lowe’s gift card. There are a lot of wins in this disclosure, wouldn’t you agree? Today is World Toilet Day. While this may sound a bit funny to you, a toilet can do more than you think. It can actually save lives. It can Flush for Good, if you will. I’ve noted in past posts that we take for granted our easy access to clean water and sanitation. While 70% of the earth’s surface is covered with water, less than 1% of it is available for human use. Clean water for drinking and bathing is a very limited resource that we need to protect. One simple way to conserve water is to use efficient toilets, faucets and showerheads that actually save water. Products with an EPA-approved WaterSense-certified seal have been shown to use at least 20% less water than standard models. Having an efficient, water saving toilet in their homes is an easy enough solution for most of my readers. But what about the fact that half the people in the world lack a safe way to go to the bathroom? Flush for Good is addressing both of these problems. Headed by American Standard, and in conjunction with the Champion Toilet line, the Flush for Good campaign is designed to increase awareness of the global water sanitation crisis and to stimulate action that protects the health of all people through well-engineered plumbing solutions. Can’t afford to purchase a new Champion toilet right now? No problem! Enter my giveaway* below and you could win a $200 gift cards to Lowe’s and use the money towards a new, efficient toilet! How will you celebrate #WorldToiletDay? *While American Standard has provided promotional support in the form of prizes, American Standard is not sponsoring or administering the giveaway on this blog. Ha! Your mom could learn a lot from the Flush for Good website. 🙂 My mom also throws towels into the hamper way too quickly. Drives me nuts! I am celebrating by posting about World TOilet Day, saying thank you to my toilet, and be thankful that I always have access to toilets and clean water! And I could really use that gift card – we are actually in need of a more efficient toilet! The efficient toilets make a big difference. We have an old one that came with out house. We moved it to a bathroom we don’t use as much so that we don’t waste water and bought more a efficient one in the bathroom we do use. GREAT giveaway. I will probably celebrate World Toilet Day with Des. More practice walking. And I’ll be editing photos and reading blogs and having dinner with in-laws! And of course, being really thankful for our two awesome toilets in this house. Tamara recently posted..Look Ma, No Hands! I only saw this on Alexa’s page before and be honest never knew this day even existed before that, but will say that after reading her post and yours now I see how this could be a real problem if we didn’t have toilets. Seriously, totally take this one for granted daily, but just so happy that we live where we have toilets and indoor plumbing, too! Janine Huldie recently posted..The PINcentive Blog Hop (Week 11) & GIVEAWAY! We’re lucky, aren’t we? So many people around the world don’t have the simple luxury of a toilet. So sad. Well- hey, it saves water people! And I DRINK a lot of it- so I pee A LOT! Your comments always crack me up, Chris. Great job saving water! It’s the little things that add up to big change, right? So much great information in this post. I plan on taking a shorter shower and encouraging my kids to do so as well. I am happy to say that my forgetful family members are already helping the cause by forgetting to flush the toilet. 🙂 I hope I win because we are in need of a new toilet in my bathroom and I’d love to get an efficient one. After writing this post last night, I found myself more conscious about the length of my shower this morning. Funny how I also have forgetful family members too. Good luck! I would love to have more efficient toilets…it’s been on my list forever!! I take quick showers, wear my clothes more than once whenever I can and try to be as careful as possible with how much water I use! That’s great, Michelle! And the efficient toilets make a big difference. You don’t realize how much water and energy you waste until you have an efficient one. “If it’s yellow, let it mellow; if it’s brown, flush it down.” Our motto drives some people in my family crazy, and it’s hard to explain why we shouldn’t do that in public, but that’s what we do at our house!! A classic motto. I can see the confusion about public bathrooms. They’ll catch on! My pleasure, Ashley! Good luck with the contest! Okay, I’m not joking. I can’t poop. I have MAJOR constipation issues so when I do go I practically throw a party. I drank a TON of coffee this morning and literally just got off the toilet, sat down and read this post so I think World Toilet Day honored me. Thank you for mentioning this cause! We could probably use a new toilet. The one in the bedroom is acting funny and won’t flush right. If it’s brown, flush it down!! I will take a shorter shower. I need to work on this too. I was overly conscious of my time in the shower today! I had no idea it’s world toilet day, lol. But, it’s interesting. And yes…sanitiation and access to fresh water is so important. I can imagine, Cyndi. I’ve learned so much about the need for sanitation and access to clean water these past few months. It’s amazing how many children die because they don’t have access to a toilet. Thanks for posting this. I feel like I have a good handle on worldly issues but realize there’s always more that can be done! 😉 Nice work, Jennifer! There’s always more that can be done. Thanks, Amanda! This is such a great giveaway and a great cause. I would totally get a new American Standard with the gc, I think we have an original 1984 beauty in the kids bathroom – it’s got to go! Those “beauties” are something else, aren’t they? At least we have them, right? I would take shorter showers. Sounds like a good plan, Jessie! love this give away! I could really use a new toilet down stairs! Sounds like many people need new toilets. Good luck! I Will Conserve Water By Taking A Shorter Shower! Sounds like a theme going on in this comment thread. Shorter showers for everyone! I shared this with my middle school daughter and explained the “why” behind a funny sounding holiday. I got to spend time this summer helping people in a 3rd world country where sanitation is a big health issue. I love that you talked with your daughter about the day, Kristen. I’m sure you could tell her some first hand stories of why sanitation is so important. Sounds like a great way to celebrate! She’s hilarious. I love – just love – how you are dedicated to this cause. It seems to simple to us westerners – to have a toilet – but it’s like or death for some. Thank you for raising this awareness. I’ve learned a lot about the need for clean water and sanitation over the past year. It really is something that is so simple. Addressing the problem helps save lives while also helping to eliminate poverty since families spend so much time trying to get water when they could be working and kids could be going to school. Just like the Fockers – “If it’s yellow, let it mellow; if it’s brown, flush it down.” Totally agree with that sentiment. We are also teaching our 3 year old we can’t run the water forever in the bath tub, and we generally take short showers- gotta be quick with little terror on the loose! I think moms with little ones are probably the most efficient water for that very reason! I teach my kids to not leave the water running while brushing teeth. They do pretty good. I will donate bottle water to our local ECHO organization. I also will save my flushes until it’s absolutely necessary. I did love the response about reading a post on potty training-hilarious! I think potty training is relevant. 🙂 Lots of flush saving going on in the comment thread! This is awesome. We are actually eco-friendly toilet shopping so this is timely. Thank you. Nice! Great way to celebrate World Toilet Day. We just moved into a new house and are in the process of changing the showerheads and lightbulbs to more conservative usage ones. I will celebrate by continuing. Sounds like a great idea. We’ve been doing the same in our old house. I think it makes a big difference! What an inspirational post! We have efficient toilets at home! Manhattan Image and Style recently posted..[My Outfit] .Breaking Rules. I love the efficient toilets. They make a huge difference! Well, I missed it! However, we are conscious of our water use, and already do the following. That’s great, Lis. I’m a stickler for the washing machine one even though I have an efficient washer that only uses as much water as necessary. I just hate running things if it’s not needed! “If it’s yellow let it mellow it it’s brown flush it down”. Great plan, Steve! Good luck with the contest. That’s great, Mary Beth. I was pleased to see that I am doing a lot of the things already too. It’s easy, isn’t it? It IS easy! Many of these things save time and money, too. I hope it’s just a matter of making enough people aware to make a real difference. I celebrated by following the age old adage: If its yellow let it mellow, if its brown flush it down…. It’s a good adage to follow! Something we can be grateful for every day! I just read a book about life in China where they went into incredible detail about the bathroom situation in rural China. Oh my gosh, I can’t believe people could stand to live like that. I literally can’t get it out of my mind. In our country, we would probably arrest someone if they treated a PET like that, let alone a human. Makes me very grateful for the luxuries we have. So true, Adrian. I’ve heard some crazy stories. Hard to believe it’s real sometimes. I am very grateful for the simple luxury of a toilet. Oh I didnt know there was a World Toilet Day! Something we take for granted thats for sure. Something so basic to us, it not available to some. I will celebrate by stopping and thinking about ways to conserve water in my home. Taking shorter showers, using the washing machine and dishwasher only when full loads are ready, and turning off water while brushing my teeth. Excellent plan, Laura. We do the same thing. It’s easy to forget at first, but I find we’re all in the habit now. I will turn the water off while I’m brushing my teeth. Awesome. I have to admit. I’m not great with this one. I will celebrate World Toilet Day by cleaning my toilet!